JIANGXI SITON MACHINERY MANUFACTURING CO., LTD.
Jiangxi Siton Machinery Manufacturing Co., Ltd., specializing in produce Tunnel Loader, Tunnel Mucking Loader and many other Tunnel Excavation Equipment, is a professional supplier and manufacturer of Tunnel Loader, Tunnel Mucking Loader based in Jiangxi Province, China. We also supply Custom Tunnelling and Mining Machinery. Crawler mucking loader is an efficient tunnel loader of consecutive production. Mainly, it is used to construction of railroad tunnels, loading operation of diversion tunnels and national defense holes. It can be used to the middle or the big lane way upon 4X4 meter. The best work condition of the mucking loader is the material rigidity less than or equal to F=12, the material dimension less than or equal to 700mm. The main act of our crawler mucking loader is controlled by the pilot valve. Operation is easy, peace and not impact. Capability is credible and maintain is facility. The machine has a fine humanism design because it has hydraulic system with wind cool, seat, cab, electric adding oil and has alarm system about journey beyond limit, oil temperature beyond height, oil route blocked, motor beyond load. These can alleviate the worker’s labor intensity. The machine is safe, easy and comfortable when the driver operates it. This crawler mucking loader is special designed for lane with big slope. The wheel mucking loader, also known as wheel haggloader or wheel tunnel excavator, is a type of underground mucking loading machinery mainly used in narrow space mining operation such as metal mine, water transferred roadway, etc. Besides, it can also be used to collect and transport (convey) different kinds of clastic rock from various engineering. Our wheel mucking loader for mining LWT-80, LWT-120, LWT-150 are efficient and energy-saving, Hydraulic transverse cutting units, suitable for excavators from 80t to 150t. Our wheel mucking loader / wheel haggloader is stable to operate. It can be used 2000 hours with no need of maintenance. The delivery cycle of this tunnel haggloader is 60~90 days. We can also customize this product for our customers, just requiring 60~120 days. Overseas customers can enjoy 24/7 after-sale service and dispatching service. We will send professional engineers there to provide optimal service. There is also components storage of this wheel haggloader to supply timely. 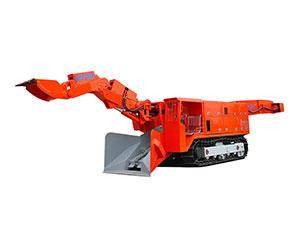 As a kind of tunnel mucking machine, tunnel mucking equipment, our track mucking loader adopts eletrical-hydraulic-mechanisem drive type, hydraulic motor and mechanism motor drive for travelling and rock muck scraper transportation. The track mucking loader, or tracked haggloader, can work continuously to excavate, take the rock residue, and transport materials to the shuttle mining car and other transshipment equipment. The conveyor can discharge the rock into the auto dumper, shuttle mining car, side-dumping car, belt conveyor, skip, etc. The arm, boom, bucket and cylinder of working mechanism are all driven by hydraulic cylinder, which is controlled by the center hydraulic control system. With reasonable layout of hydraulic system and special electrical and hydraulic protection system, the machine can be work under a safe environment. Founded in 1992, Jiangxi Siton Machinery Manufacturing Co., Ltd., is a professional manufacturer of drilling jumbo, mucking loader and shuttle mining car in China. 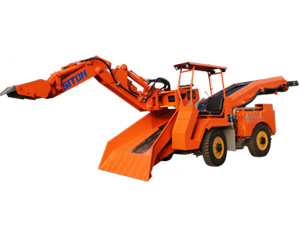 This kind of tunnel haggloader is one of our company’s main products. It has been exported to many countries and regions, winning widespread recognition and praise. You will find that siton-china.com is a good place where can find affordable tunnel loaders, our late model tunnel loaders are top of the line. We can normally find exactly what you need! 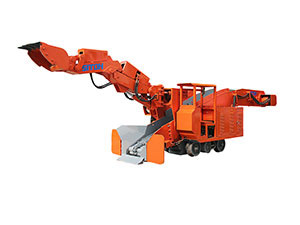 You can find many tunnel loader, tunnel mucking loader on our website at very reasonable prices.